Three young Swedish climbers have just returned from a whirlwind trip of some of the best bouldering areas in Sweden, Germany, Austria and Italy. 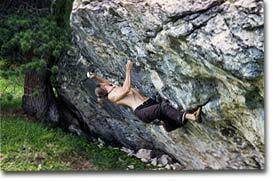 In between some hard repeats up to Fb 8a+, Björn Pohl, Stefan Pettersson and Tomas Gustavsson found enough time to set up an extensive new bouldering area at Città dei Sassi, Northern Italy. "The development of the area was done at an amazing rate. 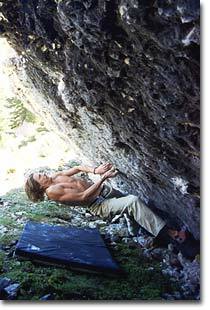 In five and a half climbing days we opened 113 new problems between 3 and 8a (V0 - V11), 29 of which are 7a/V6 or harder." said Björn. They stumbled across eight original problems marked in red paint and each new problem is now marked and numbered with blue paint so as to avoid confusion. Björn adds "it's actually the best area I've ever been to! I haven't been to Fontainebleau though... but on the other hand Fontainebleau means bad conditions 9 days out of ten." Città dei Sassi is situated at almost 2200m beneath the Sella Pass, Dolomites. The mountain refuge is just a couple of minutes walk away should the weather turn bad. But as the three from Stockholm put it "a little rain doesn't really matter though since the rock dries in no time at all, plus 99% of the problems are either very steep, or even steeper." Take the A22 motorway to Bolzano, exit at Chiusa and follow signs to Ortisei/St. Ulrich. 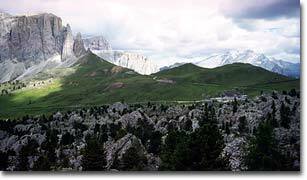 Drive up Val Gardena to Passo Sella and park the car shortly before the pass at the refuge Passo Sella. Continue on foot in a few minutes to the boulders.